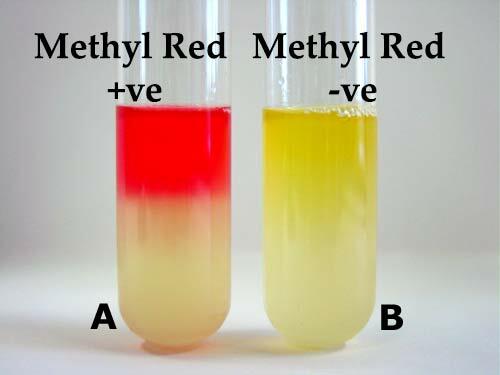 The methyl red (MR) test detects the production of sufficient acid during the fermentation of glucose and the maintenance of conditions such that the pH of an old culture is sustained below a value of about 4.5, as shown by a change in the colour of the methyl red indicator which is added at the end of the period of incubation. Clark and Lubs developed MR-VP Broth which allowed both the MR and VP tests to be performed from the same inoculated medium by aliquoting portions to different tubes. Some bacteria have the ability to utilize glucose and convert it to a stable acid like lactic acid, acetic acid or formic acid as the end product. These bacteria initially metabolise glucose to pyruvic acid, which is further metabolized through the ‘mixed acid pathway to produce the stable acid. The type of acid produced differs from species to species and depends on the specific enzymatic pathways present in the bacteria. The acid so produced decreases the pH to 4.5 or below, which is indicated by a change in the colour of methyl red from yellow to red. In the methyl red test (MR test), the test bacteria is grown in a broth medium containing glucose. If the bacteria has the ability to utilise glucose with production of a stable acid, the colour of the methyl red changes from yellow to red, when added into the broth culture. The mixed acid pathway gives 4 mol of acidic products (mainly lactic and acetic acid), 1 mol of neutral fermentation product (ethanol), 1 mol of CO2, and 1 mol of H2 per mol of glucose fermented. The large quantity of acids produced causes a significant decrease in the pH of the culture medium. a. Dissolve 0.1 g of methyl red in 300 ml of ethyl alcohol, 95%. b. Add sufﬁcient distilled water to make 500 ml. c. Store at 4 to 8 degree C in a brown bottle. Solution is stable for 1 year. Prior to inoculation, allow medium to equilibrate to room temperature. Using organisms taken from an 18-24 hour pure culture, lightly inoculate the medium. Incubate aerobically at 37 degrees C. for 24 hours. Following 24 hours of incubation, aliquot 1ml of the broth to a clean test tube. Reincubate the remaining broth for an additional 24 hours. Add 2 to 3 drops of methyl red indicator to aliquot. Observe for red color immediately. Examples: E. coli, Yersinia sps, etc. Examples: Enterobacter aerogenes, Klebsiella pneumoniae, etc. A weak positive is red-orange. If an orange color is seen, incubate the remainder of the broth for up to 4 days and repeat the test after further incubation. In this case it may also be helpful to set up a duplicate broth at 25C. Originally the paired MR-VP tests were used to distinguish between members of the family Enterobacteriaceae, but now they are used to characterize other groups of bacteria including Actinobacteria. It is recommended that further biochemical tests be performed on pure cultures for complete identification. The methyl red test must not be performed unless the medium has been incubated for a minimum of 48 hours. Tests that are run too early may result in false-positive interpretation. It is important that a light inoculum be used. If an inoculum is too heavy, bacterial growth may be inhibited and result in invalid test results. Incubation periods up to 5 days may be necessary for the methyl red test. so an orange color still means a positive result? I have a question. If a particular bacteria is unable to ferment glucose, can I conclude that it is unable to metabolize other carbohydrates eg: lactose, maltose, sucrose?